H. E. Marshall wrote Our Island Story over a century ago, and its popularity continues to rise. Now this audiobook provides the listener with a collection of the best and most engaging stories from H.E. Marshall's three volume set. The collection is narrated by Anna Bentinck and Daniel Philpott, whose voices are charming and inviting. The listener will entranced by their British accents and their soothing tone. H. E. Marshall conceived Our Island Story as a collection of bedtime stories, and this is perhaps what makes this history book so appealing and delightful. 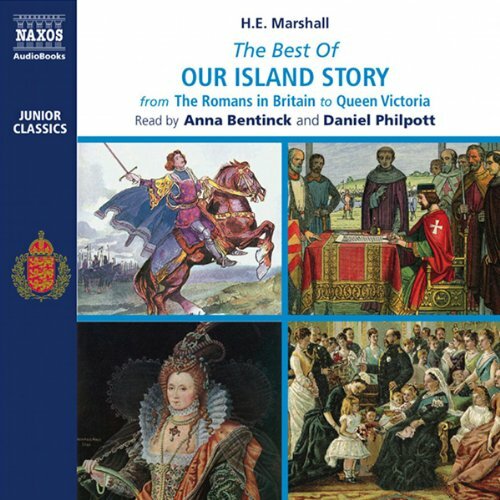 Our Island Story by H. E. Marshall is an Edwardian history book for younger listeners (age six to 12) that tells the story of England, concluding with the reign of Queen Victoria. Having released it unabridged in three volumes, Naxos AudioBooks now offers an attractive collection of the main stories and personalities. This skilful abridgement nevertheless maintains the narrative of British history, from the arrival of Julius Caesar to the height of the British Empire and the long reign of Queen Victoria. Listen to more of Our Island Story. Where does The Best of Our Island Story rank among all the audiobooks you’ve listened to so far? My daughter loved listening - it is one of her favorites because she loves all the different stories (she is seven). Would you listen to The Best of Our Island Story again? Why? Yes, it was very well read. It's aimed at children but it is also interesting for adults. I recommend this audiobook. As a rough guide I'd say for ages 7 and up.